Our guest blogger this week is Dr. Adem Ali, an assistant professor in the Department of Geology and Environmental Geosciences. Dr. Ali attended the Faculty Technology Institute in 2014. In this post, Dr. Ali describes his strategies and success using Poll Everywhere in his courses. Poll Everywhere is an adaptable and now a popular tool that we have a campus license for at the College of Charleston, which makes it free for college instructors to use and makes it possible to use in large classroom settings. After my training at the Faculty Technology Institute during summer of 2014, I immediately implemented Poll Everywhere into my courses and lectures. Since, I have enjoyed using Poll Everywhere and it has increased the level of students’ interest and engagement, transforming the course into active learning. The courses I teach have class sizes ranging from 25 in my higher level elective courses to over 100 in the general education classes. I use Poll Everywhere to create conceptual questions in multiple formats that can be answered by students instantly and LIVE. I embed the Poll Everywhere polls/questions into my PowerPoint presentations throughout my lectures, and the students can answer by going to a webpage using their laptops and clicking the answer, texting an answer to an SMS number using their smart phones, or by tweeting. This capability has allowed students to use web and cellular devices. It has made the learning experience more flexible, and it has brought it into their world making learning more fun and engaging. 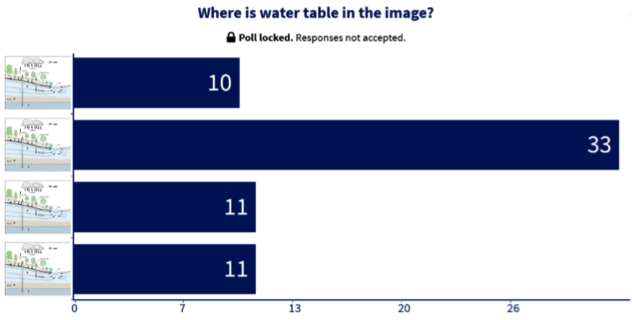 One of the advantages of using this tool is that it allows you to embed the poll/questions into your existing presentations, like PowerPoints. I found this to be very important because it made my lectures more engaging without requiring me to spend a lot of time. 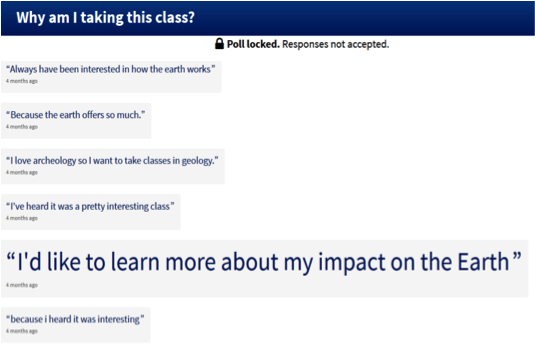 I simply included the poll slides throughout the lecture slides. The tool allows the students to watch the answers as they are coming in live. As an option, the live answers can also be hidden until all students have participated, providing the flexibility to adapt to polls for discussion points or to use them as quizzes for assessment. Poll Everywhere also provides the number of responses, providing evidence for level of classroom engagement. Another important aspect of Poll Everywhere is that it allows the instructor to immediately see the level of comprehension of content based on the response patterns on the polls/questions, providing instructors with the opportunity for giving instant feedback. In my lectures, these capabilities have allowed me to quickly identify content/concepts that were not grasped by the students and we could spend more time discussing misconceptions, and at times revisit topics to help students refine their understandings. I have also used this tool as an attendance record by posting simple questions as a segue to the lecture of the day. I used the attendance data generated by Poll Everywhere for grading individual students on their class participation in the final grade rubric. The challenges I experienced when using Poll Everywhere all related to student mobile device issues – students with smartphones were unable to participate in certain types of polling and students with restricted phone plans had texting limitations. Overall, I think Poll Everywhere is a great tool for student engagement and assessment. I plan to continue to use this tool in my future classes to promote student engagement in lectures and also to refine or revisit topics of discussion to maximum students’. To learn more about the College of Charleston Campus license for Poll Everywhere, please visit http://blogs.cofc.edu/tlttutorials/2013/09/10/poll-everywhere/.